Home / News / Politics / The Senate paid no heed to Dr. Halstead’s warning two years ago, now results in the endangerment of vaccinated children. The Senate paid no heed to Dr. Halstead’s warning two years ago, now results in the endangerment of vaccinated children. 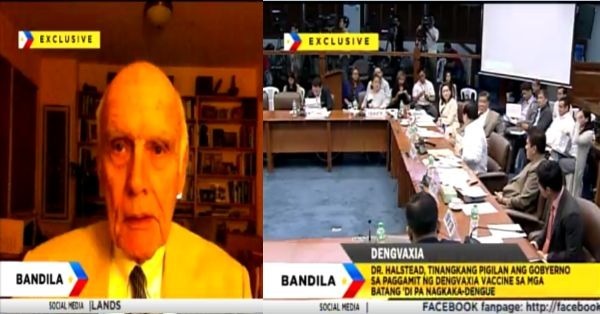 Dengue and mosquito-borne viruses expert, Dr. Scott Halstead sent a video to stop the Senate from immunizing children with Dengvaxia due to the possible adverse side effects of the vaccine to those who haven’t had dengue before, but based on senate transcripts, it was never brought to light. In his video, Dr. Halstead instructed that before administering the vaccine, they must identify which child has had dengue before for the vaccine is only applicable to them. He then said that the vaccine can do harm to those who are “zero negative”, which means those who haven’t had dengue before. The expert’s warning was based on his study on protective and immunological behavior of chimeric yellow fever vaccine which was published in March 29, 2016, a couple of days before the Aquino administration started their mass dengue vaccination program. Former Health Secretary Garin on the other hand said that she ignored Dr. Halstead’s warnings for it was countered by a number of other experts. The surprisingly the video of utmost importance was not presented during the Senate hearing on the sudden purchase of Dengvaxia. It was Dr. Antonio Dans who personally brought up the summary of Dr. Halstead’s findings during the Senate hearing. He also invited those who were present to watch the entire video after the hearing. Also, Former Health Secretary Paulyn Ubial was present during the hearing, and was questioned on why she didn’t any testing happen under her leadership. She answered that it was just too expensive. Dr. Halstead is ready to fly to the Philippines if the Senate invites him.